December 27, 2013, 3:12 p.m.
YouGov research for The Sun found that the top TV programme and the top reality or talent show remained unchanged in 2013. Downtown Abbey took the prize as the nation’s favourite TV show, chosen by 15% of the public, with a two-way tie for second between Doctor Who and ITV crime drama Broadchurch. The third series of Game of Thrones aired this year, and its popularity continues to gain momentum, 8% of Brits picked it as their favourite show of 2013, up from 4% last year. Meanwhile Breaking Bad, which reached a thrilling conclusion in September was chosen by 6%. Strictly Come Dancing, which concluded on Saturday with Abbey Clancy winning the 11th series of the show, was the nation’s favourite reality or talent show of 2013. 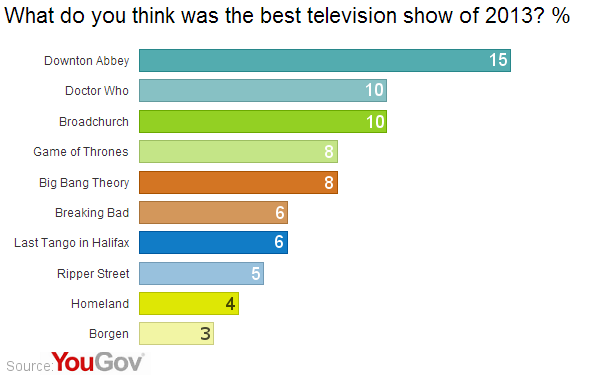 The next most popular were I’m A Celebrity and The Great British Bake Off (both with 13%). X Factor came in 5th, with 5% choosing it as their favourite programme. The results for best reality show threw up some interesting generational splits. The Great British Bake Off, credited with inspiring a generation of bakers, is the favourite talent show of 27% of 18-24 year olds and just 10% of over-60s, whilst Strictly Come Dancing was the favourite show for 29% of over 60s and just 10% of 18-24s.